1. Set up a food processor with a small bowl. With the motor running, drop in the garlic. Stop and add the cilantro. Pulse until chopped. Add the remaining ingredients and pulse to form a soft paste. Smear some of the paste over both sides of each chop. Scrape the rest of the paste into a small sauce pan. 2. Set up a gas or charcoal grill to produce medium high heat. Grill chops directly over the heat, about 3 to 4 minutes per side or until they reach 125 degrees to 130 degrees Fahrenheit for medium rare doneness. Transfer to a platter. 3. Gently heat the reserved peanut paste and stir in enough water to make the sauce thick but pourable. 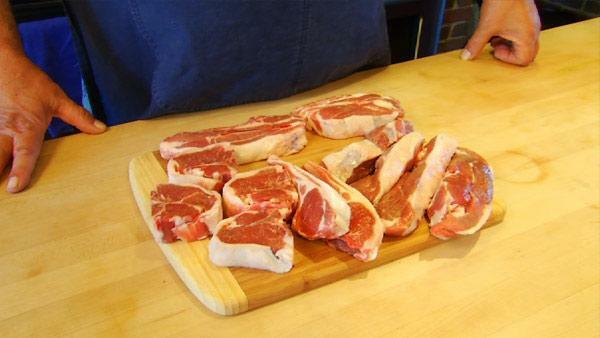 Spoon the sauce over the lamb chops and serve at once. Note: Alternatively, you can broil the chops for 4 to 5 minutes per side.